Great place to meet people and explore Sevilla from! Top hostel, the nicest hostel I have been to, rooms were good, the bathroom was spacious & the staff was very nice! The hostel offers many things to see from Seville !! I'll definitely return!!!! What a good place to stay!! Such a warm welcome to spain:) we woke up with the smell of coffee and cookies (which you can get for free) and in the evening we could join the free dinner. This is so Nice because it brings everyone together:) thanks one hostel one!! Hasta la pronto!! Nice atmosphere, really great staff, they make everyone feel at home and the activities that they organize are a great way to meet new people. The location is super, you can easily reach al hotspots from there by foot and it is located at a nice square where you can enjoy some tipical Spanish breakfast in the sun. Would definitely recommend staying here! Centro one is een prachtig plekje aan een rustig plein in het centrum van Sevilla. Het personeel is open en vriendelijk en weet waar je in de stad moet zijn voor bijzondere ervaringen. Ook kun je meedoen aan een gratis stadtour, een gratis pubcrawl en verzorgen ze ook het avondeten. Je bent niks verplicht, maar kunt je overal voor inschrijven. Een fantastische plek dus! I didn’t wanna leave! 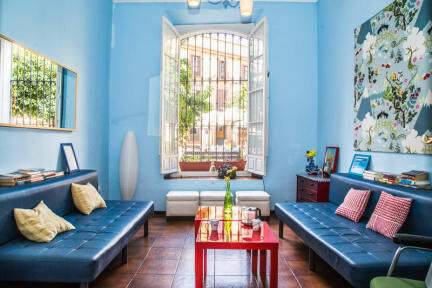 The hostel is located perfectly and has a true Spanish vibe. The free dinner is a perfect way to meet other travelers! But the best is the staff! They make you feel so welcome and really put an effort in getting to know you. This hostel is definitely unique! Feels like one big family here, lovely place to stay for a solo traveler. Beds are comfy, and showers are clean and warm. Only point of improvement would be the cold inside during the winter months. Some more/better heaters would be welcome especially in the reception area/common room. Dinners were very good! Loved it that they organised a special dinner and drinks for Christmas eve. Met lots of people to hang out with! Would def go again! Having dinner together is a really nice way to socialize if you’re travelling alone. The free city tour is very good and the night’s pubcrawl is also very fun. It was the best hostel in Andalusia I went to! Hostel is niet wat ik had verwacht. Matrassen super slecht, de spiralen voelde ik gewoon! Kussens stelde niks voor! Badkamer beschimmeld en de kamer stonk naar schimmel. Totaal geen sfeer in dit hostel misschien was het gewoon niet de juiste tijd. Medewerkers zijn wel lief en doen erg hard hun best.